Saree is a traditional Indian Women wear. 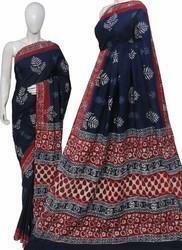 We have a good collection of traditional Hand Block Printed cotton Saree, developed by professional Karigar. Minimum Order Quantity is 10 Pcs in Assorted Designs & colour. Wholesale Price is INR 580/- for cotton Printed Saree.